You may have noticed that the smartest and most intelligent people you meet in life are single more often than not. And that’s not something that happens by chance. That isn’t by accident. You might think that smart girls are single because they are off-putting. You might assume that smart girls are just plain arrogant to the point that they think that they are superior to other people. But that’s not really the case. 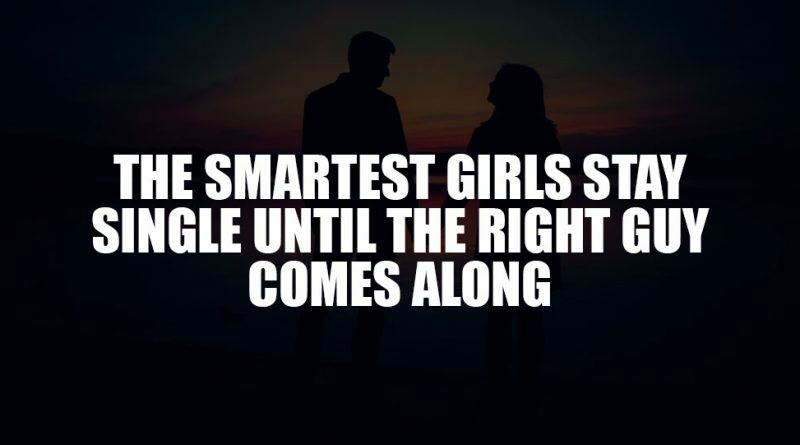 Smart girls aren’t single because they happen to think too highly of themselves. They aren’t single because they are conceited and self-centered. They are single because they know their exact worth – and they would never settle for being with a man who they know wouldn’t serve as an equal match for them. You have to understand that in any kind of relationship, balance and harmony are always going to be of the essence. This is especially true in romantic relationships. There are just so many men out there who are easily intimidated by strong and intelligent women who aren’t afraid of going after what they want in life. And when there is intimidation in a relationship, there is a clear imbalance. And when there is an imbalance, it can be a cause for dysfunction. Strong and intelligent women are going to be some of the most independent people you are ever going to meet in this life. They are never afraid of just speaking their mind and going after what they want. And they’re not single because you believe them to be afraid of being with someone who might eventually break their hearts. They’re just single because they know that they shouldn’t be forcing themselves into any romantic situation. They have a healthy level of self-esteem and they are always striving for something in life to the point that they don’t feel compelled to be in a romantic relationship to feel fulfilled. They don’t pressure themselves to be in relationships just for the hell of it. They don’t try to get with boys just because it’s what society expects them to do. The smartest women in the world are always busy. They are always working on something. They are always finding to channel their energy into. They like to focus on their professional lives. Life is an eternal opportunity for them to learn and grow as individuals. That’s why they don’t really try to preoccupy themselves with love and relationships so much. They know that it just isn’t worth it to get into a relationship with someone who doesn’t allow them to grow or develop into the person they’re meant to be. They are fiercely independent and they are never afraid of just going out and grabbing what they want. They are always going to value whatever alone time they can get because they are perfectly comfortable in their solitude. They never feel like they have to be surrounded by large groups of people to feel validated or important. They are their own validation. They know that they don’t really need to cling on to other people to survive in this life. They know that they are perfectly capable of achieving success in this world on their own. Whenever you first get into a relationship, you are always going to give up some of your independence. That comes with the package. And for a lot of smart women, they find themselves not wanting to do so just yet. They feel like they have so much more to do in this world and a relationship would only hold them back. And of course, these intelligent women are never going to tolerate such immaturity. They aren’t going to want to be with men who only want to get into relationships for the status and the perks that come with it. They will want to only be with men who truly understand what love is; with men who are mature enough to know what it takes to make a relationship work. They aren’t going to want to waste their time on people who aren’t deserving of her attention in the first place. A strong woman like her is always going to be able to find happiness in her own life regardless of whether she is in a relationship or not. She is always going to find a sense of fulfillment and meaning in her days without having a boy at her side. Is she open to a relationship? Well, if the right guy comes along, why not? But until then, she’s going to be perfectly fine just living the life that she knows she’s meant to live.